How Do You Create an Event Marketing Video for an Event that Hasn’t Happened Yet? It’s a common problem. You’re planning an event and need marketing materials, but there’s no photography, no existing video footage, no visuals of any kind. What can you do to raise awareness and build excitement? 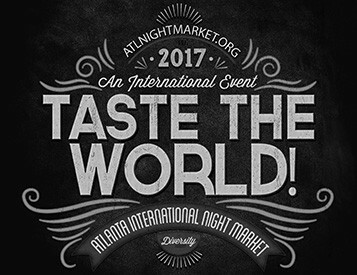 When the organizers of the Atlanta International Night Market contacted me, they needed a video ASAP. They had meetings already scheduled with community leaders, vendors and potential sponsors, and thought a video would help explain the concept of a Night Market. To create the video, I searched online for free (or almost free) stock footage and video clips.—food footage as well as multicultural performances such as dance, singing, parties, and musicians. I used After Effects to combine the clips onscreen, and add typography and animation effects. The end result is a video that simulates the experience of an actual Night Market. For the next event, which is planned for November, we’ll be using footage shot during the inaugural April event. Many thanks to David Trotter and David Lee for the project. I’m looking forward to working with you more in the future. Of course, once the Atlanta International Night Market was underway, I was able to wander the venue capturing shots of attendees, performers and vendors alike. When the gates opened at 5 pm, I focused mostly on the food and cute kids. But then, after the sun went down, I found the event much more visually exciting. The footage I captured was used to promote the second International Night Market. Here’s just one of the promotional videos we produced for social media. Another type of event marketing video is produced during the event, and used for future fundraising. This example for The Hambidge Center for Creative Arts and Sciences is a good example. The 2016 Art Auction was captured on video over several days, including a private preview party hosted by High Museum Curator Michael Rooks, event set-up at the Goat Farm Arts Center, and the event itself. Many thanks to Hambidge Executive Director Jamie Badoud for his help and support, and to Hambidge Communications Director Dayna Thacker. Also thanks to Terry Kearns for recommending me, and to Atlanta artist Joe Dreher (Joe King ATL), for introducing me to the Atlanta art scene. This last example is for a small neighborhood event, the Mead Road Mardi Gras Parade. Funds raised by the event go to the Decatur Education Foundation to fund music grands for the City Schools of Decatur, GA.